Toyota Motorsport Group last year took an electric race car, the EV P001, to the Nürburgring to set a lap record for electric cars. This year TMG is taking the next iteration, the EV P002, to the Pikes Peak International Hill Climb, to see about racing to the clouds. The specs on the new machine are a step forward from the EV P001. Along the way Toyota seems to have changed their intent from being the sole provider of electric drive train components to a race series, to being one participant in a range of components suppliers in the burgeoning field of electric racing. The TMG EV P002 being tested at Paul Ricard Circuit in France. Let's start with the EV P002. It, like the EV P001, is built on a Radical chassis but with electric drive train components. The twin axial flux motors produce a 350 kilowatt output (approx 470 horsepower), and a maximum torque of 900 Nm. Each motor has its own TMG-designed inverter. It is powered by a massive 42 kilowatt-hour battery pack, and has an off-board DC charger. TMG predicts a top speed of 150 miles/hr, in the Pikes Peak configuration. The EV P001 had twin motors, supplied by EVO Electric, but with a maximum output of "only" 280 kilowatts. TMG does not disclose the supplier of the EV P002 motors, but a close look at one of the pictures published by TMG and we see a motor that suspiciously looks like EVO's. Japanese rally champion Fumio Nutahara will drive the car. 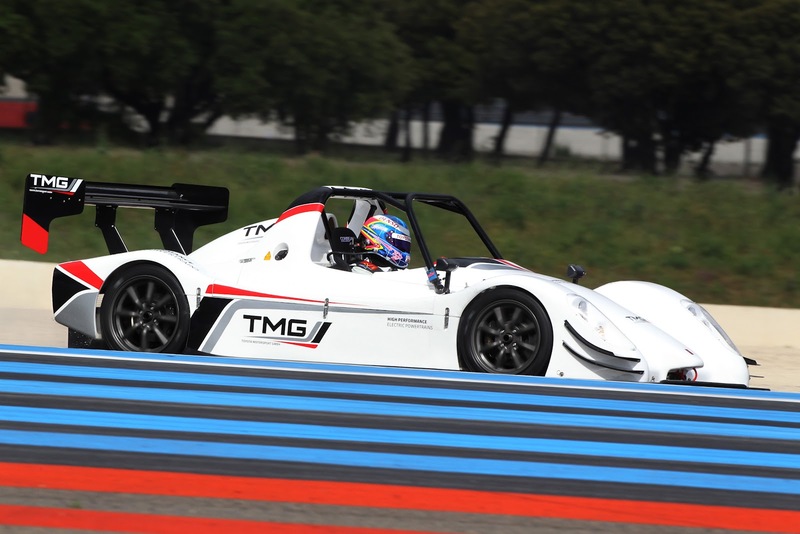 In May, TMG conducted extensive testing at the Paul Ricard circuit in southern France to verify car and drive train performance. Last year TMG described the project as a collaboration among several organizations, but this year the only listed collaborator is RK1 Inc. The context is that there are several organizations developing electric car racing series. TMG clearly wants to be a supplier of components to the teams which will race in these series. TMG's purpose is to supply parts and expertise to racing teams, and if the future of racing really is electric, then TMG would be foolish to ignore the wave of change. Last year, after attaining the Nürburgring lap record for electric cars, TMG said that event proved their drive train technology was "ideal to power any future single-make electric motorsport series." This was clearly meant to appeal to the racing series organizers, and position TMG as the supplier to some kind of spec racing series. This press release does not contain such a statement, but still works to position TMG as a supplier to electric racing teams.